Honorable Duty joined a list of 55 horses that eventual Horse of the Year Gun Runner defeated in 2017 after finishing second in the $500,000 Stephen Foster Handicap presented by GE Appliances (GI) but trainer Brendan Walsh hopes the 6-year-old can redeem himself in Saturday's 37th running of the 1 1/8-mile race at Churchill Downs. Owned by David Ross' DARRS Inc, Honorable Duty returned from a 177-day layoff on May 20 to defeat a field of conditioned-allowance horses by five lengths at Churchill Downs under jockey Corey Lanerie. 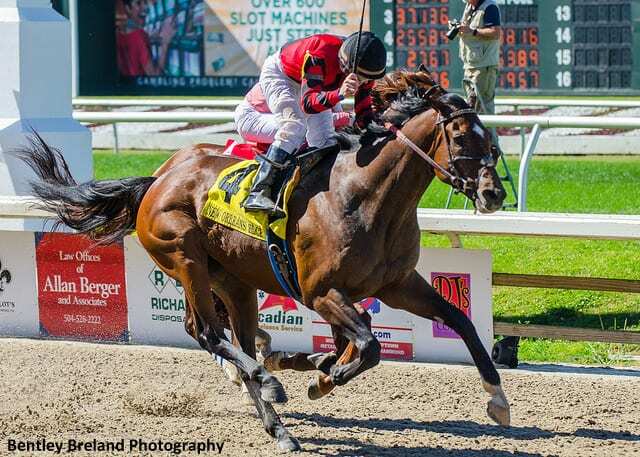 The gelding by Distorted Humor is a three-time graded stakes winner with victories in the 2017 Mineshaft Handicap (GIII) and New Orleans Handicap (GII) at Fair Grounds and Lukas Classic (GIII) at Churchill Downs. The Stephen Foster Handicap is the richest of five graded stakes races on Saturday's special 11-race night racing card that begins at 6 p.m. (all times Eastern). Total purses on the evening are more than $1.4 million, which makes it the most lucrative racing day for horsemen at Churchill Downs outside of the Kentucky Derby and Kentucky Oaks programs. Other stakes events scheduled on the night are the $200,000 Fleur de Lis Handicap presented by Budweiser (GII) for fillies and mares at 1 1/8 miles headlined by La Troienne (GI) runner-up and multiple Grade II winner Farrell; the $200,000 Wise Dan (GII) for 3-year-olds and up at 1 1/16 miles on turf led by last year's champion Turf Male World Approval and two-time Grade I winner Divisidero; the $100,000 Matt Winn (GIII) for 3-year-olds at 1 1/16 miles featuring romping Sir Barton winner Ax Man; and a well-matched cast of 13 3-year-old fillies in the $100,000 Regret presented by Cintas (GIII) at 1 1/8 miles on grass. The Stephen Foster Handicap field from the rail out: Honorable Duty (ridden by Lanerie, trained by Walsh, 118 pounds, 6-1 morning line odds); Patch (Luis Saez, Todd Pletcher, 116, 10-1); Hawaakom (Brian Hernandez Jr., Wes Hawley, 117, 12-1); Uncle Mojo (John Velazquez, Todd Pletcher, 114, 10-1); Matrooh (Santo Sanjur, Cipriano Contreras, 115, 20-1); Backyard Heaven (Irad Ortiz, Jr., Brown, 121, 6-5); Lookin At Lee (Ricardo Santana Jr., Steve Asmussen, 115, 12-1); Irish War Cry (Jose Ortiz, Graham Motion, 119, 5-1); and Pavel (Mario Gutierrez, Doug O'Neill, 117, 5-1). The Stephen Foster Handicap has been carded as Race 8 at 9:39 p.m. NBCSN will televise the race from 8:30-10 p.m. to launch its 2018 “Breeders' Cup Challenge Series: Win and You're In presented by America's Best Racing” television schedule. NBCSN's coverage will be hosted by Laffit Pincay III, who will be joined by analysts Randy Moss and Hall of Fame jockey Jerry Bailey, as well as reporters Donna Brothers and Britney Eurton. Also, Horse Racing Radio Network (HRRN) will air live coverage on 93.9 The Ville in Louisville and Sirius/XM 93 from 8-10 p.m.
Several fillies and mares in Saturday's $200,000 Fleur de Lis Handicap presented by Budweiser (GII) at Churchill Downs like to show early speed but trainer Wayne Catalano believes Farrell could be the quickest of them all. Farrell, a 4-year-old filly by Malibu Moon, led nearly every step of the way in the La Troienne (GI) on Kentucky Oaks Day at Churchill Downs but tired late to finish second. Another filly who could add to the early pace setup is recent allowance winner Awestruck, who rallied from just off the pace to cruise to a 6 ¼-length win on May 10 at Churchill Downs. For the fourth year in a row, the Fleur de Lis is a Breeders' Cup Challenge Series “Win and You're In” stakes event, which means the winner will be guaranteed a berth in the $2 million Longines Breeders' Cup Distaff (GI) on Nov. 3. The Fleur de Lis – which means “Flower of the Lily” and honors the French symbol that is incorporated into the city of Louisville's Flag – will be run as Race 7 at 9:09 p.m. (all times Eastern). It will be televised live on NBCSN from 8:30-10 p.m. The Fleur de Lis field from the rail out: Fuhriously Kissed (ridden by C.J. McMahon, trained by Tony Quartarolo, 115 pounds, 10-1 morning line odds); Mopotism (Mario Gutierrez, Doug O'Neill, 118, 8-1); Blue Prize (ARG) (Jose Ortiz, Ignacio Correas IV, 118, 7-2); Streamline (Chris Landeros, Brian Williamson, 116, 15-1); Song of Spring (Ricardo Santana Jr., Neil Howard, 118, 6-1); Awestruck (Irad Ortiz Jr., Rusty Arnold II, 115, 8-1); Valadorna (Brian Hernandez Jr., Mark Casse, 118, 4-1); Apologynotaccepted (Julien Leparoux, Brendan Walsh, 117, 12-1); and Farrell (Channing Hill, Catalano, 119, 3-1). Ken and Sarah Ramsey's speedy multiple graded stakes winner Shining Copper hopes to upset 2017 Eclipse Award Champion Turf Male World Approval and two-time Grade I winner Divisidero in Saturday's 29th running of the $200,000 Wise Dan (GII) at 1 1/16 miles over Churchill Downs' Matt Winn Turf Course. “We're going to be on the front end and see if they can catch us,” Ken Ramsey said. “After this horse won the Fort Lauderdale on Jan. 13 at Gulfstream, I took him down to Barbados but he finished second behind my other horse Sir Dudley Digges (in the Barbados Gold Cup). It was a good race but he didn't quite get over the ground well in his last start in the (Old Forester) Turf Classic. Shining Copper (34-9-5-7—$847,854) returned from a 13-month layoff in September 2017 and was transferred to trainer Mike Maker from Chad Brown. The 8-year-old chestnut will be ridden by Irad Ortiz Jr. and is 6-1 on the morning line. The Wise Dan field, which will go as Race 6 at 8:30 p.m., from the rail out: Divisidero (ridden by Jevian Toledo, trained by Kelly Rubley, 121 pounds, 3-1 morning line odds); Shining Copper (Irad Ortiz Jr., Maker, 123, 6-1); Inspector Lynley (Jose Ortiz, Shug McGaughey III, 121, 10-1); World Approval (John Velazquez, Mark Casse, 126, 6-5); Mr. Misunderstood (Florent Geroux, Brad Cox, 121, 10-1); Mr Cub (Chris Landeros, Ian Wilkes, 121, 10-1); Flatlined (Corey Lanerie, Scooter Dickey, 121, 12-1); and Parlor (Brian Hernandez Jr., Eddie Kenneally, 121, 10-1). This entry was posted in Breeders' Cup, Racing and tagged backyard heaven, Brendan Walsh, churchill, churchill downs, distorted humor, farrell, Fleur de Lis Handicap, honorable duty, Matt Winn Stakes, regret stakes, Stephen Foster, win and you're in, wise dan stakes by Press Release. Bookmark the permalink.